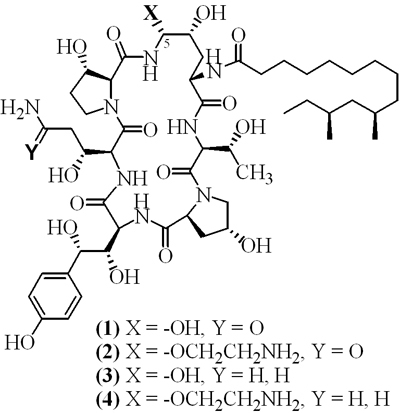 Pneumocandin B0 (1) was a novel 1,3-β-D-glucan synthase (GS) inhibitor (GS IC50=70 nM) related in structure to the known antifungal compound echinocandin B. It was a relatively high molecular weight lipopeptide with a number of hydrogen bond donors and acceptors. As such, the compound lacked appreciable water solubility and oral bioavailability. In addition, its antifungal spectrum was limited to several Candida spp. Chemical modification of (1) led to the discovery that cationic groups could greatly improve the potency, spectrum and water solubility of the compound. 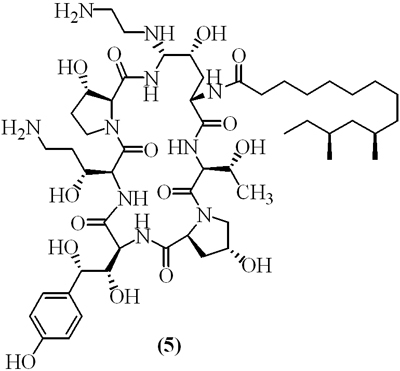 Introduction of ether-linked amino groups at the C5-orn position gave rise to compound (2), which was approximately tenfold more potent than the natural product and possessed potent activity against Aspergillus spp.. Reduction of the 3-hydroxyglutamine to the 3-hydroxyornithine gave analog (3) which was 15-fold more potent than (1). Introduction of both modifications gave the dicationic derivative (4), a compound with unprecedented potency (GS IC50=1 nM). In depth evaluation of (4) revealed that it had unexpectedly poor pharmacokinetics in chimpanzees and displayed unacceptable toxicity. Chemistry was developed that allowed introduction of amine-linked cationic groups with moderated basicity yielding improvements in the pharmacokinetic and toxicological profile. The aza-analog of compound (4) was selected as a pre-clinical candidate and after extensive evaluation was developed as caspofungin (5).